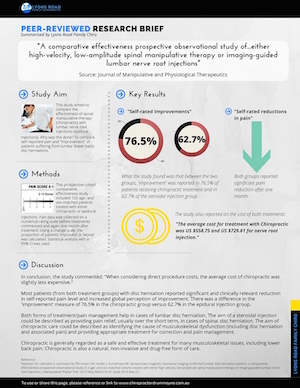 Study: chiropractic more effective than hospital outpatient treatment in the management of low back pain. In what was one of the first studies of its kind, the effectiveness of chiropractic treatment was compared to hospital outpatient treatment for low back pain. The study, published in the British Medical Journal (BMJ), found that for those patients suffering from chronic or severe back pain, chiropractic treatment was more effective than hospital outpatient treatment. We have summarised the results in the following research brief - please feel free to use this on your website providing you reference this page. The study used a self-rating pain scale as well as other biophysical measures of improvement including leg raises and lumbar flexion. The pain scale used was the Oswestry pain disability questionnaire - an extremely important tool commonly used by researchers to measure a patient's permanent functional disability. The test is considered the 'gold standard' of low back functional outcome tools (Fairbank et al.). For the purpose of this study, chiropractic care was defined as chiropractic manipulation or some form of treatment at the discretion of the chiropractor. Hospital outpatient treatment refered to treatment used by hospital staff including simple forms of manual therapy (Maitland mobilisations). For the primary measure of pain improvement, the study reported that chiropractic was more effective than hospital outpatient management. For secondary measures (straight leg raises and lumbar flexion) the study also reported that patients treated by chiropractic did better than those treated in hospital. Chiropractic commonly helps in many cases of back pain. According to the Chiropractors' Association of Australia, chiropractors are the spinal health experts, and are the only health professionals who study the neuromuscular system for five years full time at university. Each week, there are approximately 200,000 visits to Australian chiropractors for a broad range of reasons. Many of these visits are for musculoskeletal issues including back pain. Please read more about the benefits of chiropractic for back pain here. If you would like to discuss treatment options for back pain, please feel free to call (02) 9819 6182 or email Lyons Road Family Chiropractic today. Chiropractic versus epidural injections for disc herniation pain - a comparative study. Meade T W, Dyer S, Browne W, Townsend J, Frank A O. 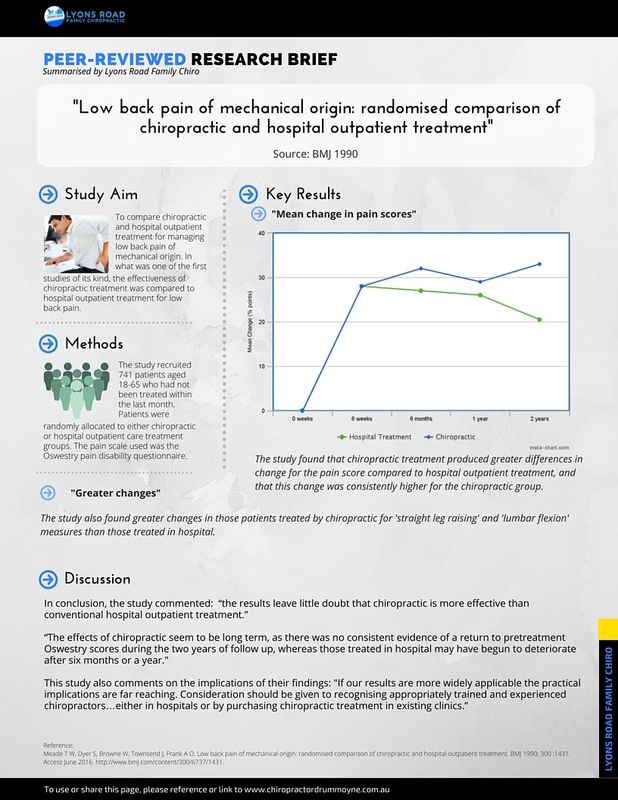 Low back pain of mechanical origin: randomised comparison of chiropractic and hospital outpatient treatment. BMJ 1990; 300 :1431. Access June 2016 http://www.bmj.com/content/bmj/300/6737/1431.full.pdf. Fairbank JC, Pynsent PB. The Oswestry. Disability Index. Spine 2000 Nov 15;25(22):2940-52; discussion 52.